The parish of Wherstead adjoins the borough of Ipswich on its southern side, and Wherstead Road is perhaps the grimmest of the main routes into a town which does not always present itself particularly elegantly to anyone travelling into it. But Wherstead churchyard is a remote, secretive place, half a mile from the nearest road. It used to be more remote: The track which leads up to it has recently been blessed with the pleasures of the Suffolk Food Hall. In theory, it's a good idea - expensive local produce is the very thing to get the middle classes out of Tesco and Sainsbury's. But I must say that I baulk at shopping anywhere that describes its stock as 'gourmet goodies'. Be that as it may, you either linger or scurry past the new neighbour, and carry on up the track until you leave all the noise and clamour behind you. At the top of the hill sits St Mary in its pleasingly rolling graveyard. From here you have a view of one of East Anglia's most famous landmarks, the Orwell Bridge, which cuts the parish of Wherstead in two. Behind you, hidden by rising ground, is 19th century Wherstead Hall, once the headquarters of Eastern Electricity, now home to the privatised power company currently calling itself E-on. Beyond that, on the far side of the Manningtree road, is television's "Jimmy's Farm". But you would not know that the modern world came anywhere near, to stand here among the bird song and the rustling of the bean fields. Wherstead has never been a big place. At the time of the 1851 census, when the population of many rural East Anglian parishes reached their peak, there were just 238 people living here. Despite the proximity to Ipswich (the Cornhill in the centre of town is barely two miles from this church) St Mary is little-known. It is visible on its hill top to a boat coming up the Orwell, which sprawls dramatically in the valley below, but hidden from the view of any road. The river leads the eye south-eastwards to the cranes of Felixstowe and Harwich. On the far bank, the brooding woods look strangely foreign, as if we were in some kind of outpost, and proper, wild Suffolk began over there. Until the summer of 2008, I had never been inside this church. Unusually for the Ipswich area, it is kept locked, and I had never seen a keyholder notice until a Sunday in June, when Martha and I got out our bikes and went for a ride. Now, there were three telephone numbers listed in the lychgate. As I dialled one, it began to rain: but it turned out that this was fortuitous, because the churchwarden had been painting his garage, and the rain meant he'd have to stop, and could come over and open up. St Mary is pretty much an entirely Victorian church, but one of particular interest. The architect was Richard Phipson, who restored the 15th Century tower and rebuilt the nave and chancel, retaining the Norman south doorway. Big lions along the roofline recall his gargoyles at the town centre St Mary le Tower. Stepping inside, the interior is almost entirely 19th century, but of high quality, a testament to the commitment and money of the Dashwood family of Wherstead Hall. One possible medieval survival is a composite figure of St Edmund in a window on the north side, but it might be a Victorian confection. The only later note is the lovely 1963 window depicting David the Shepherd and David the King, by Dennis King. While Phipson's work is found at nearly a hundred East Anglian churches, Wherstead's interior is raised above the mundane by two of the great craftsmen of 19th century Ipswich. Henry Ringham was a woodcarver working in east Ipswich (Ringham Road off of Cauldwell Hall Road is named after him) and this was his last major commission. He is responsible for the woodwork, including the benches and the roof. Another Ipswich craftsman, the stone mason James Williams, created the font with its elaborate carvings, including a terrific St Michael. There is more of his excellent work at Brome. The glass is also of the highest quality, by important workshops: the Works of Mercy in the west window are by William Holland, while the two windows up in the sanctuary are both signed by Alexander Gibbs. The pulpit, carved by a Belgian workshop, is perhaps more of an acquired taste. I had been worried by the state of the church when we first arrived: two windows were boarded up. It turns out that this little church is a regular prey to vandalism, and that is why they keep it locked. Unfortunately, of course, a culture of vandalism to a building is a difficult thing to turn around. 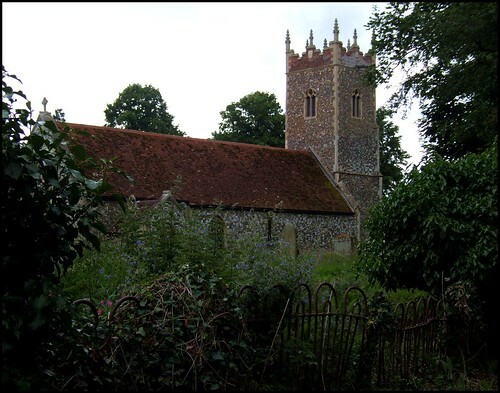 Most East Anglian churches are neither kept locked or vandalised. Ecclesiastical Insurance asks parishes to keep their churches open during the day, because this dramatically reduces the chances of vandalism. Most insurance payouts are not for items stolen, but for damage caused to doors and windows of locked churches. It is hard to suggest that Wherstead church would benefit from being kept open when it is already deeply enmeshed in a cycle of damage, but you can't help thinking that the fortress mentality of a handful of Suffolk churches does them no good, as well as little credit. Be that as it may, this lovely little church deserves as many visitors as it can get - why not a welcoming sign down by the Suffolk Food Hall, another up at Jimmy's Farm, and an occasional open door for pilgrims and strangers? It's worth a try.